Wharfedale had a convincing win away at Macclesfield. They dominated the opening quarter and came out after the interval and controlled the game playing strong and committed rugby. Harry Bullough opened the scoring for Dale when he intercepted a long pass on his own 22. He then had the speed and stamina to reach the try line before any Macc cover could get near him. Jack Blakeney-Edwards added the conversion. This was slightly against the run of play as the home side had dominated possession since the kick off. Tom Morton kicked a penalty for the home side when Dale were pinged for offside; a recurring theme in the opening 25 minutes. Dale then upped the gears and produced some outstanding rugby. The best move was when Louis Brown fielded a Macc clearance and ran back with interest. San Gaudie was in support and swept forward before feeding Reece Ward who nearly made the line. Three phases later Josh Burridge crashed over for an unconverted try for Dale. Blakeney-Edwards added a penalty for the Greens. Wharfedale then lost shape and discipline and the penalty count started to mount. Macclesfield fought back and closed the gap to 13-15 by half-time with two unconverted tries. Dan Lomax and then Sam Moss touched down after good play by the Macc forwards. In between the tries Harry Bullough was shown a yellow card after being caught offside, this being the umpteenth penalty given away, Bullough went to the bin. Both sides ended the first half with 14 men when Macc’s Sam Stelmaszek was carded for a bit of foul play. Dale opened the second half by pinning the home side back in their 22. Three good attacks fizzled out when the ball was knocked on when the Greens could have been more patient. But the Green Machine was now putting immense pressure on the Blues. On 53 minutes another Macc player (Francis Barker) was rested by the referee for some foul play. Dale soon had an attacking 5 metre line out. They had learnt from the previous charges at the Macc line and patiently went through 12 phases before George Hedgley crashed over under the posts. Blakeney-Edwards added the two points. Wharfedale have been striving all season to follow their coaches chant of “back up a score with another one”. Breaks by Brown and Blakeney-Edwards soon had the Greens in Macc’s 22 and the forwards clawed their way to the line. It was Phil Woodhead who darted over and grabbed the bonus point try. Blakeney-Edwards slotted the extras to give Dale a comfortable 16 point lead. All credit to the Cheshire lads as they tried to get back into the game. Brown broke up one attack when he stripped the ball when a Macc try looked possible. He broke up to half way and some good interplay could have set up a try but the ref was on the spot to see a forward pass. Back came Macc into Dale’s 22 and strong play seemed to have won them a penalty close to Dale’s line. A moment of stupidity by their winger, Dan Lomax, saw the decision reversed and Lomax shown a yellow card. Pressure again told and Macc were desperate to run the ball out of defence. Harry Bullough pounced on another longish pass to score his second and Dale’s 5th to end the scoring. It was a relief to see Dale go away to one of the teams nearer the bottom of the table and put in a good performance. The faithful have seen the Greens beat table-toppers and then lose to a team that are struggling. This was an important win; any win away from home is vital but this win keeps the momentum going, keeps the team going forwards, keeps the coaches pressing for greater efforts on the back of positive results. The coaches and players still need, and they will, look at one or two areas of the game that can be improved; but they can do this from a very positive outlook. This was another whole-hearted performance by the whole squad. It is heartening, on a dry pitch, to see the backs getting more involved in play and scoring tries. Next week sees another difficult match against South Leicester. They are one place above Macclesfield and 15 points behind Dale. The faithful are needed on Saturday to rouse the players and keep them going forward. There were some excellent moments to savour. The highlight for your scribe was to see Reece Ward in support of a break by Brown and Gaudie. Suggestions were made that he was actually lurking in the advanced area from a previous scrum! Josh Burridge had another inspiring game and drew many comments from admiring Macc fans. Josh covered an amazing amount of territory in attack and defence. Blakeney-Edwards produced some sniping runs that made the defence always have to think about what he was going to do. Louis Brown made some useful contributions especially under the high ball and in counter attacking. 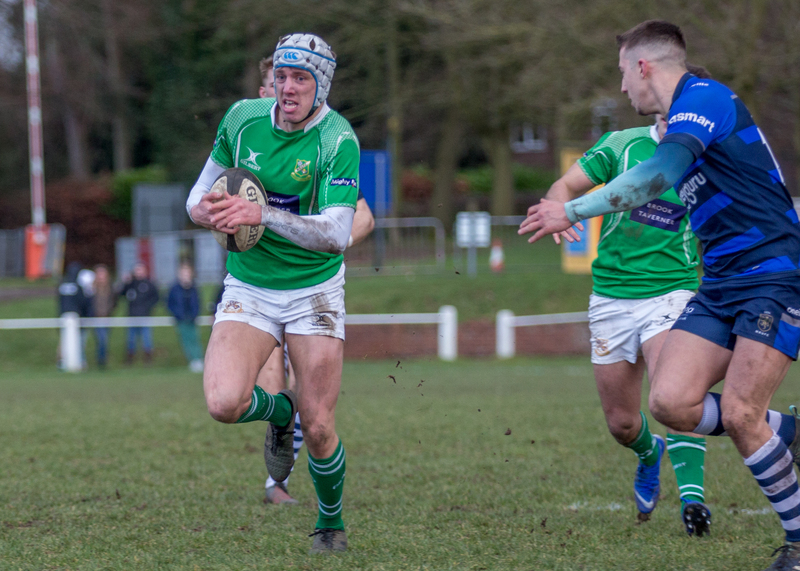 Wharfedale: – Brown, Cicognini, Bullough, Edwards, Wellock, Blakeney-Edwards, Gaudie (Woodhead 53), Altham (Asejevs 79), Stockdale (Baldwin 74), Ward (Hirst 74), Hedgley, Rhodes (c), Houghton, Walker (Metcalfe 66), Burridge.